eBay Review: Mixed Metal Brush Set... Under £5! Today I have another in-depth eBay review for you! I of course love my monthly eBay hauls however some products more detail given and this one of them! 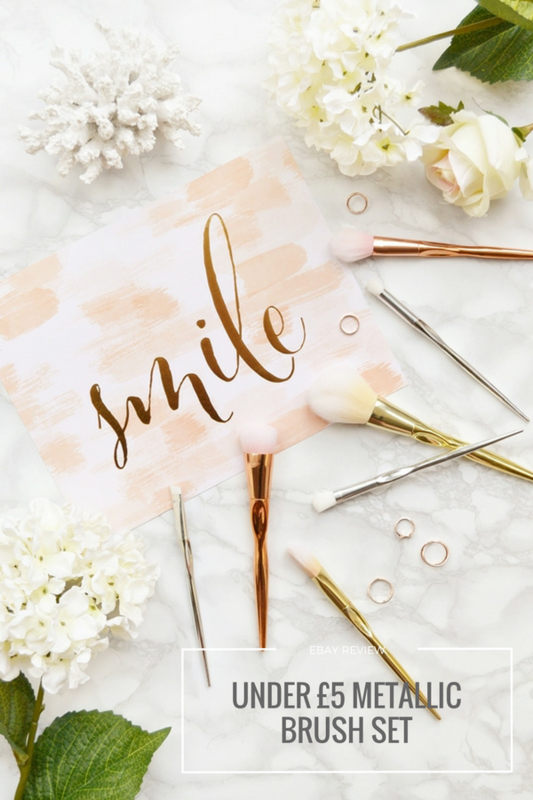 I've had this stunning mixed metal brush set for a while now and really have been loving using them and even looking at them... they look perfect all together in a pot on my desk! If you are thinking these do look familiar then you would be right at they're a dupe for the Real Techniques Bold Metal collection, just not at £12-£22 per brush! 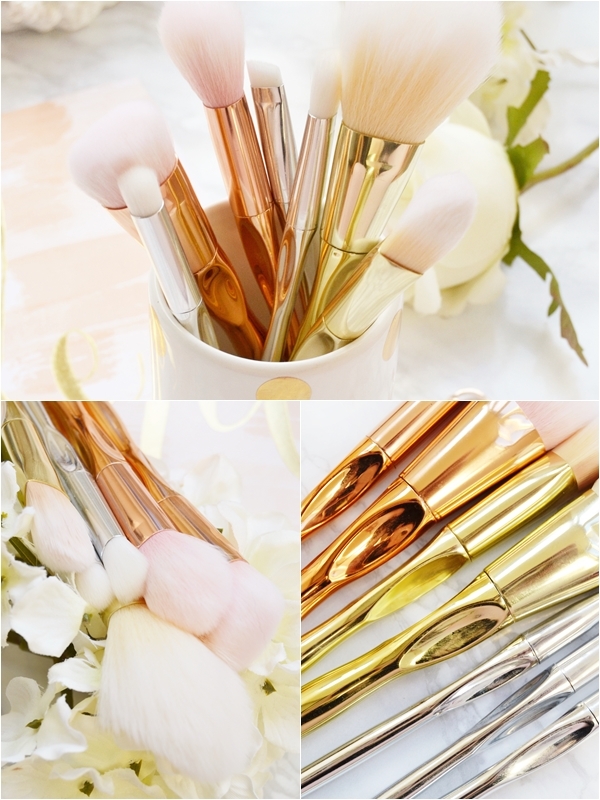 This exact 7-piece set can be found on eBay here for £6.99 or without the indents to the handle (exactly like the Bold Metal brushes) here for only £4.98 - also available in all rose gold, silver and gold to the listing. From left to right in bottom two images (above) - Triangle Foundation brush, Flat Contour brush, Powder brush, Blush brush. Angled Liner brush, Pointed Crease brush, Blending brush. On comparing these ultra cheap brushes to the Real Technique Bold Metal brushes, as I have a few, the notable difference is the weight. This doesn't affect the use of the brush however the RT brushes do have some weight to them and feel high quality for that reason. I should also point out that these brushes are free from any logos or branding! As for the brush fibres and ferrules these all very similar indeed, expect ultra soft bristles and high shine metallic handles. Comparing the contour brush to the £22 Bold Metal version, it is slightly smaller and the bristles aren't as dense, however the brush still definitely works well with contour powders. Side note - If you are wondering why I went for the slightly indented handles over the actual RT dupe brushes. I already have a similar set so I wanted them to match and I prefer this kind of handle especially for eye brushes as it makes me hold the brush in the correct way for blending. For the price, especially for the cheaper £4.98 brushes here, I really am delighted with the overall quality. As you can hopefully see from the images the brush fibres are so soft and each and every brush works and does the job as it should. I also found they were packaged well and had minimal shedding even on their first wash. Really just a stunning brush set! Oh, that's a tricky one as I've been using all the brushes to the set and enjoying them. However the powder brush has to be my favourite as it's beautifully soft and perfect for sweeping over the T-zone... I also can't help but think the similar RT Bold Metal version would have set me back £22! 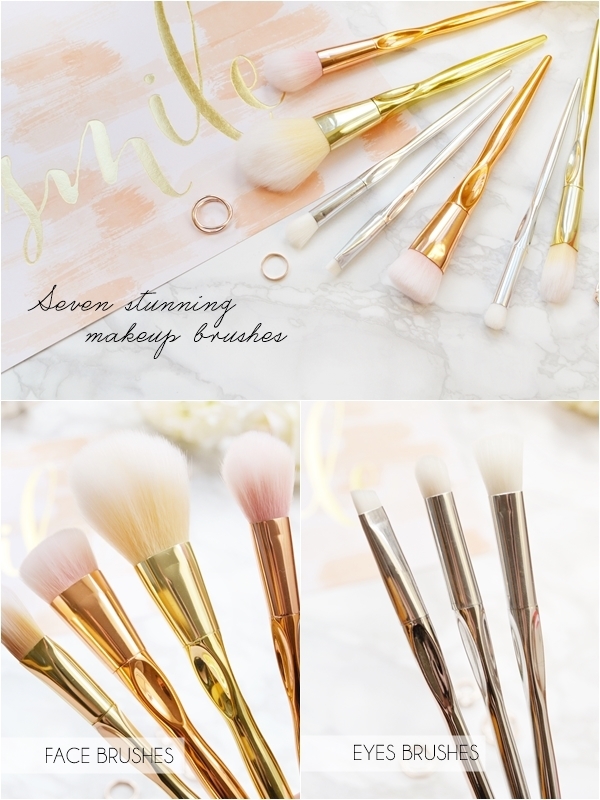 In fact the 7 similar brushes from Real Techniques would cost over £100?! But back to my favourite brushes... I also love the triangle-shaped foundation brush as it's good to get in all the creases and contours of the face and again is such perfect quality. But seriously I really do love all of these brushes! Let me know if you pick up this brush set or the even cheaper version! You can find my past eBay reviews here.